Each year the WSU Center for Real Estate and the Kansas Chapter of Certified Commercial Investment Members (CCIM) present their annual Lifetime Achievement Award. The award honors local professionals who have made outstanding contributions to the commercial real estate profession, and is a great honor and a tribute to individuals who represent the finest examples of Wichita’s rich history of entrepreneurship in the real estate industry. 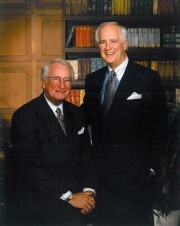 Nestor and Michael Weigand, brothers at the helm of Wichita’s oldest residential and commercial real estate company, have been named the 2009 recipients of the Kansas CCIM chapter and WSU Center for Real Estate Lifetime Achievement Award. Nestor Weigand has been has been an active real estate professional for more than 45 years. He is a past president of the National Association of Realtors, and continues to serve on its board of directors. He is also a past president of the the Kansas and Wichita associations. In 1990 and 1991, he served as chairman of NAR’s Resolution Trust Committee Task Force during the height of the savings and loan bailout. He also was the 2001-2002 world president of FIABCI (the International Real Estate Federation, headquartered in Paris, France). Mike Weigand real estate career began in 1956, and he has played a key role in reshaping the face of Wichita over the past half century. Highlights of his career include overseeing development of the Highland House, leasing for the numerous waves of suburban shopping malls in Wichita (including the Wichita Mall, Twin Lakes and Normandie Center, and Towne East Mall), and handling the development, land assemblage, planning and leasing for Towne West Shopping Center. His is also a past president of the Wichita Area Association of Realtors. Nestor, as chairman, is the third generation of the Weigand family to run J.P. Weigand & Sons Inc., which was started in 1902 in downtown Wichita by his grandfather, John Patrick Weigand. Mike serves as the company’s senior vice president. The Weigands are the fifth recipients of this award, joining Colby Sandlian, the late Jack Hunt, George Ablah and Jack DeBoer.